NEW BOOK!!! Konstantin Kovalev-Sluchevsky. New Zvenigorod Annals (Chronicles of Zvenigorod). The city of Zvenigorod located near the Russian capital Moscow is known from ancient times for its unusual history and mystery. Nowadays this suburban neighborhood is often called the Switzerland of the Moscow suburbs (or Russian Switzerland), since the town has not only a unique Spa possessing healing waters but also holy springs healing the soul. Every year over half a million tourists and pilgrims take a half-hour ride from Moscow to visit the city. It was in the city of Zvenigorod where the famous icons of Andrey Rublev – now preserved in the Tretiakov Gallery – were accidentally discovered in 1918 and ever since studied by art historians. For its symbolic personification of the Image of Russia, Rublev’s famous icon The Zvenigorodsky Savior acquired the name The Russian Savior from an American researcher. The Zvenigorodsky Savior also highlighted the final and only colored scene of Andrey Rublev, the black-and-white Soviet-banned movie by Andrey Tarkovsky, the famous Soviet film director who later immigrated to Europe. Several of his other famous movies, such as Solaris, were shot in Zvenigorod. The famous Rublevka – a highway to the west of Moscow – is also a part of Zvenigorod’s history. This most prestigious and expensive place in the vicinity of Moscow, indeed of all of Russia, is the original «island of millionaires» where from the XIX century nouveau riche and celebrities have settled. The beauty of nature and the fresh air typical for these upper reaches of the Moscow River have attracted the super rich seeking solitude, comfort, glamour and pathos. The famous Rublevka, formely called Zvenigorod Road or Tsar’s Road, ends right at the ancient walls of Zvenigorod, well-known for its unique monuments of medieval Russian architecture – the majestic Savvino-Storozhevsky Monastery with Cathedral of Nativity (of the XIV–XVII centuries), the Cathedral of Assumption on Gorodok (of the XIV century), built by Prince Yuri Zvenigorodsky, the son of Dmitry Donskoi. Zvenigorod, now one of Russia’s major tourist attractions, went though a rebirth of its identity after the significant restoration of its monuments demolished in Soviet times. Zvenigorod is now one of the important centers of tourism in the very center of Russia. In different times of its history, Zvenigorod and its vicinity hosted many famous people – Icon painter Andrey Rublev, Tsar Alexey Michailovitch, Emperor Peter I, Grand Princess Elizabeth Feodorovna, descendants of Napoleon from the line of Eugene Bogarne (Eugene de Beauharnais), poet Alexander Pushkin, writers Anton Chekhov and Michael Prishvin, artist Isaak Levitan, composer Sergey Taneev, singer Fyodor Shaliapin and the film star of the ХХ century – Lubov Orlova. The fortress of the Savva monastery was thus built: the stone walls and towers were erected. And within the walls – the czar’s palace (on the right side), a refectory, a bell tower (clock-tower), the chambers of czarina Maria Miloslavskaya (on the left side). Konstantin Kovalev-Sluchevsky. Zvenigorod and Zvenigorod’s Russia. The Treasures of a Moscow Suburb. Stories, essays and investigations. Moscow, 2009. - 488 p.: ill. 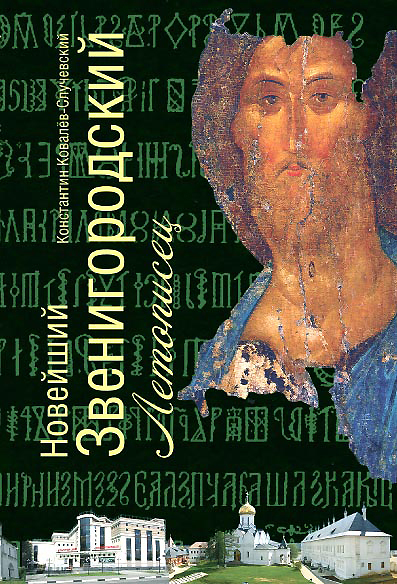 In this book, Konstantin Kovalev-Sluchevsky (K. Kovalev), the famous writer and historian, offers his readers an unforgettable journey in time and space. Kovalev discloses the mysteries of the neighborhood’s history and the stories of its people in his fascinating tales and essays, written in the genre of historical investigation. The edition is richly illustrated with unique old miniatures, art reproductions and photos. 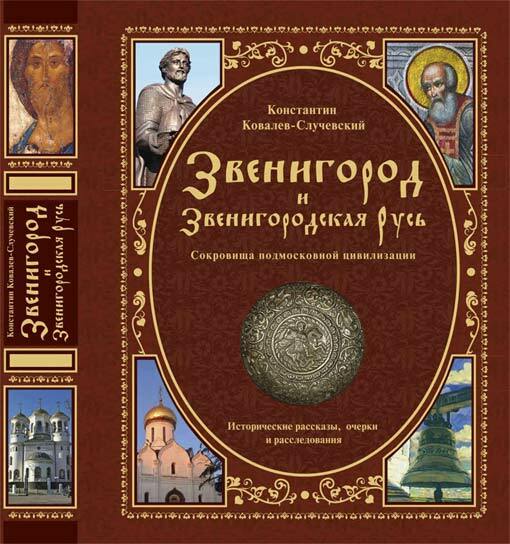 The appendix contains the centuries-old Chronicles of Zvenigorod created by the author. Written in an easy yet descriptive style, this book is also a well-illustrated guide for tourists, guides, and travelers both beginners and advanced. The literary and history essays are united by the author’s fresh outlook on the cultural heritage and interpretation of the history of the region. The book introduces the concept of Zvenigorod’s Russia (Zvenigorod Rus), an important however not commonly accepted concept of Russia’s cultural history and geography. The book is written as a collection of scenes with illustrations incorporated in the text full of secrets, mysteries and enigmas. This book is aimed at all those interested in the real Russia, its past and present. Konstantin Kovalev-Sluchevsky (Konstantin Petrovich Kovalev) – writer, historian, television anchorman and host, culture expert and traveler, professor of the Institute of journalism and creative writing (IZLT, Moscow). Born: 09.27.1955. He worked in the Institute of World Literature of the Russian Academy of Sciences: as a researcher, a scientific secretary of the Pushkin Committee and the editor–in-chief of the «Nasledie» («Heritage») Publishing House. Kovalev has authored scientific research articles, lectured and resided at Oxford University in Great Britain, the Humanitarian Institute in Paris, and the Center of Slavic Studies «Vita Nova» on the Capri (Italy). He teaches at the Institute of Journalism and Literary Creativity in Moscow. Kovalev is the author and the anchorman of series of movies on Russian cultural history, broadcasted on the First TV-Channel of Russian, member of the Russian Union of Journalists and Union of Writers. Among his most popular books are: «Orpheus of the Neva River» (received the 1986 Award of the Council of Writers and several other awards); «Mystic Word», «Bortniansky», «Modest Mussorgsky», «Names and Persons of Russian Culture», «Visa to the End of the World», «Savva Storozhevsky: Life Story in Facts, Myths and Hypotheses» (got a National Award in Best Book of 2007 in the Biography category), «Yury Zvenigorodsky, The Great Prince (The Grand Duke) of Moscow» (selected as one of the best books of 2008) and others, some have been translated into foreign languages. Konstantin Kovalev-Sluchevsky. The New Zvenigorod Annals (Noveishij Zvenigorodskij Letopisec). Moscow: Veche, 2010.– 128 с. : ill. 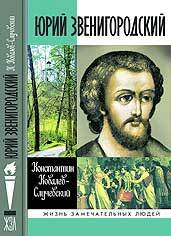 This book – continuation of the previous works of the author about Zvenigorod. The city located near the Russian capital Moscow is known from ancient times for its unusual history and mystery. Nowadays this suburban neighborhood is often called the Switzerland of the Moscow suburbs (or Russian Switzerland), since the town has not only a unique Spa possessing healing waters but also holy springs healing the soul. Every year over half a million tourists and pilgrims take a half-hour ride from Moscow to visit the city. It was in the city of Zvenigorod where the famous icons of Andrey Rublev – now preserved in the Tretiakov Gallery. The famous Rublevka – a highway to the west of Moscow – is also a part of Zvenigorod’s history, formely called Zvenigorod Road or Tsar’s Road, ends right at the ancient walls of Zvenigorod, well-known for its unique monuments of medieval Russian architecture – the majestic Savvino-Storozhevsky Monastery with Cathedral of Nativity (of the XIV–XVII centuries), the Cathedral of Assumption on Gorodok (of the XIV century), built by Prince Yuri Zvenigorodsky, the son of Dmitry Donskoi. Zvenigorod is now one of the important centers of tourism in the very center of Russia. In different times of its history, Zvenigorod and its vicinity hosted many famous people – Icon painter Andrey Rublev, Tsar Alexey Michailovitch, Emperor Peter I, Grand Princess Elizabeth Feodorovna, descendants of Napoleon from the line of Eugene Bogarne (Eugene de Beauharnais), poet Alexander Pushkin, writers Anton Chekhov and Michael Prishvin, artist Isaak Levitan, composer Sergey Taneev, singer Fyodor Shaliapin and the film star of the ХХ century – Lubov Orlova. 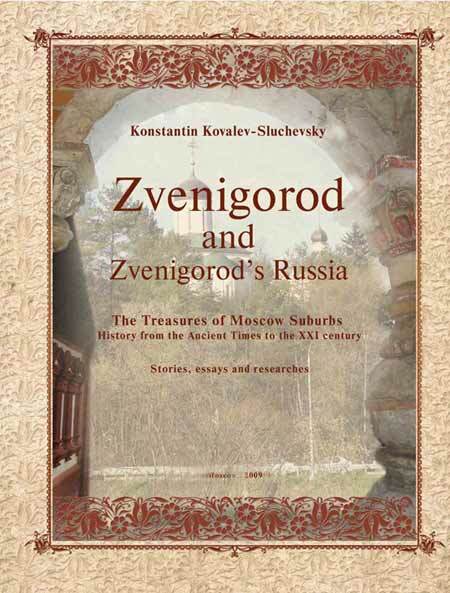 In this book, Konstantin Kovalev-Sluchevsky (K. Kovalev), the famous writer and historian, offers his readers an unforgettable journey in New Zvenigorod Annals. 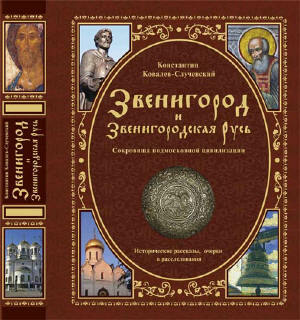 The edition is illustrated with old miniatures, art reproductions and photos, contains the centuries-old Chronicles of Zvenigorod created by the author. This book is aimed at all those interested in the real Russia, its past and present, especially – for historians and experts. Savva Storozhevsky, Savva, Pushkin, Zvenigorod, Andrey Rublev, Eugene Bogarne, Andrey Tarkovsky, Sava, Savvino-Storozhevsky monastery, Timur, Tamerlane, Storojevskij, Storojevski, Storozevsky, Gorodok, Russian sacred, Yury Dmitrievich, Alexey Mikhailovich Romanov, Maria Miloslavskaya, Dmitry Donskoy, Storozhi, Lavra, Eugene de Beauharnais, Josephine de Beauharnais, Levitan, Chekhov, Taneev, Shalyapin, Glazunov, Richter, Prishvin, Switzerland near Moscow.